Our American-made ceramic dog bowls are chew-proof and feature a heavy-weight construction and stable wide profile, which eliminates tipping, movement, and spillage. Our stoneware pet bowls are dishwasher safe and lead free with an easy to clean glaze finish. 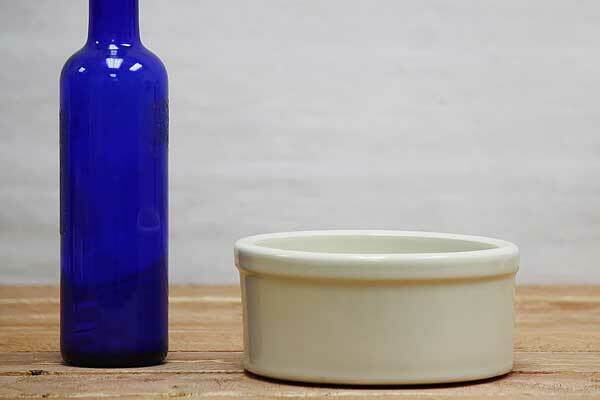 Be assured of your pet's safety since these bowls contain no lead or harmful chemicals. They can be used inside or out, and our variety of sizes can suit any size of dog, cat, rabbit, or other pet. Sanitary ceramic water bowls are perfect for any pet that eats and drinks. The large ceramic dog bowl is suitable for extra large dogs. The small white ceramic bowl suits cats, rabbits, and other small pets. The medium stoneware pet bowl is for everything in between. For other durable stoneware check out these ceramic fruit bowls and Ceramic Utensil Crocks. It's easy to clean and the dog can't knock it over.